Description and life cycle. 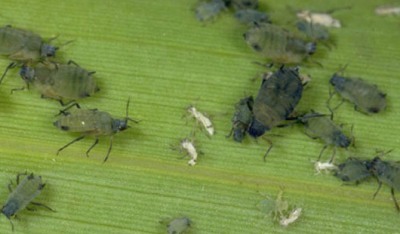 Corn leaf aphids are bluish-green in color with dark legs and cornicles (tailpipes at the end of the abdomen), and usually less than one-eighth inch in length. Like all aphids, they have a piercing-sucking mouthpart that feeds on plant phloem. Corn leaf aphids excrete a sugar-rich honeydew that can cover corn leaves, tassels and silks. Corn leaf aphids and cast skins from molting. The corn leaf aphid is not known to overwinter in Iowa, but migrates on airstreams each season. Females give live birth to nymphs via asexual reproduction during the summer. Wingless forms are more common, however, migratory winged forms are produced during crowded conditions. Heavy corn leaf aphid infestation. Damage. Feeding by large aphid colonies can reduce yields significantly. Aphids feed on upper leaves, in the whorl or on unemerged tassels. Heavy corn leaf aphid infestations may cause leaves to curl, wilt and become yellow. Tassels and silks can become covered with honeydew. Aphid colonies can slowly kill the tassel and top leaves of a corn plant. The plant responds by shunting nutrients to the feeding area and not to the developing ear, resulting in stunted ears or even barren plants. The most severe damage occurs between the late-whorl and pollination stages. Scouting and management. Scouting for corn leaf aphids must be done before tasseling - ideally three weeks before. Developing colonies are most commonly found deep within the whorl. Stop at five locations and examine twenty plants. Carefully pull the whorl leaves away from the stalk and unroll the leaves to estimate the number of aphids. Closer to tasseling, aphids move from within the whorl and are very exposed to weather and natural enemies. Take note of beneficial insects (e.g., ladybeetles and lacewings) and/or parasitized mummies; consider not treating aphids if more than 20 percent are parasitized. Spraying for corn leaf aphids while they are protected deep in the whorl is not effective. Treating for corn leaf aphids after tasseling is usually not a cost-effective management decision because aphid populations will decline naturally. A well-timed spray while aphids are outside the whorl or on the tassel is recommended when they exceed thresholds. Corn fields can be particularly sensitive to corn leaf aphid feeding if they are drought-stressed. If 50 percent of the plants have more than 100 aphids per plant, tassels are coated in honeydew and plants are under drought stress, treatment may be justified. There are several products registered in Iowa for corn leaf aphid (Table 1). Follow label directions and pay attention to spray guidelines. Erin Hodgson is an assistant professor of entomology with extension and research responsibilities. She can be contacted by email at ewh@iastate.edu or phone (515) 294-2847. Links to this article are strongly encouraged, and this article may be republished without further permission if published as written and if credit is given to the author, Integrated Crop Management News, and Iowa State University Extension and Outreach. If this article is to be used in any other manner, permission from the author is required. This article was originally published on July 17, 2009. The information contained within may not be the most current and accurate depending on when it is accessed.